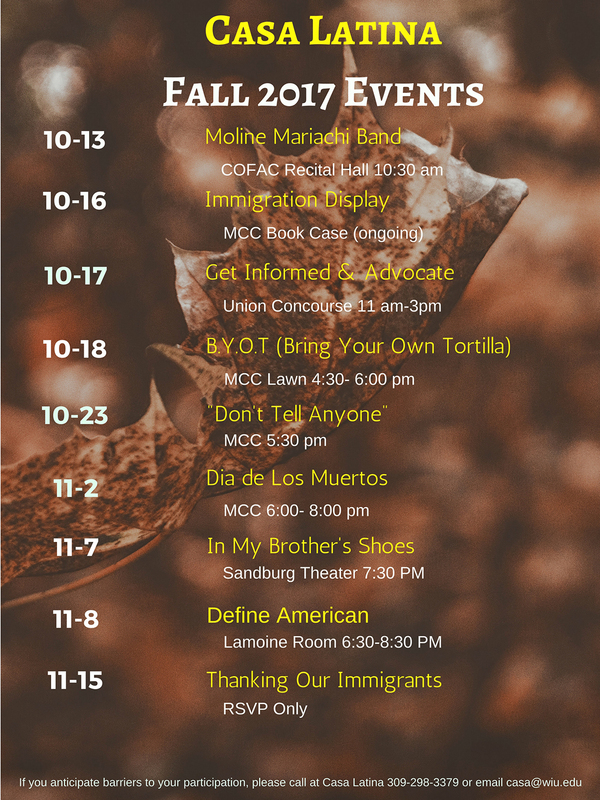 MACOMB, IL – The Casa Latina Cultural Center at Western Illinois University will host a variety of events during the Fall 2017 semester. • Friday, Oct. 13 – 10:30 a.m.: Moline Mariachi Band, College of Fine Arts and Communication Recital Hall. • Monday, Oct. 16: Opening of a display of several books pertaining to immigration in the bookcase at the Multicultural Center. • Tuesday, Oct. 17 – 11 a.m. – 3 p.m.: "Get Informed and Advocate," University Union Concourse. • Wednesday, Oct. 18 – 4:30-6 p.m.: "Bring Your Own Tortilla," on the lawn of the Multicultural Center. Free event and meat will be provided. • Monday, Oct. 23 – 5:30 p.m.: Film and discussion, "Don't Tell Anyone" at the Multicultural Center. The film is a 2015 Peabody Award winning documentary focusing on immigrant activist Angy Rivera, who shares her parallel journey of coming out of the shadows as undocumented and a survivor of sexual abuse. • Thursday, Nov. 2 – 6-8 p.m.: Dia de Los Muertos at the Multicultural Center – learn the history of the event and how it is celebrated in the Latino culture. • Tuesday, Nov. 7 – 7:30 p.m.: Film screening, "In My Brother's Shoes," in the University Union Sandburg Theatre – co-sponsored with the Veteran's Resource Center. • Wednesday, Nov. 8 – 6:30-8:30 p.m.: "Define American: Building Community," in the University Union Lamoine Room. The event is a combination of media, dialogue and a peace walk. • Wednesday, Nov. 15: "Thanking Our Immigrants," RSVP only. For more information about any of these events, contact the Casa Latina Cultural Center at (309) 298-3379.